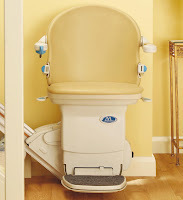 Castle Comfort Stairlifts offers top brand stairlifts, keen prices and fast installs for all those seeking stairlifts in Macclesfield, Cheshire. And all work comes with our no-quibble guarantees and famous customer service satisfaction. Give us a call today on 01625 886599. If however, you are looking for fascinating facts about the area then feel free to read on. Here we are in Macclesfield in Cheshire. It’s the home of Castle Comfort Stair Lift’s Cheshire office where you can find out all about the services we offer, the reviews we get (at Macclesfield and other areas) and get advice from our local professional team. Castle Stairlifts founder Keith himself goes back a long way in Macclesfield, well before stairlift days. He was head hunted and 'imported' there by a ceramic tile specialist in the early 1970s - as his Stoke on Trent pottery industry training made him hot property! Keith's professional contacts in 'Macc' have continued for nearly four decades. Apart from going there weekly to shop (its quicker to get from Newcastle under Lyme to Macclesfield than to Stoke on Trent's Hanley shopping centre - and it's FREE PARKING) - the stairlifts firm has it's office located at the building of the MD's friend Paul Williams Paul has continued to trim Keith's hair since he stopped being a scruffy hippy! 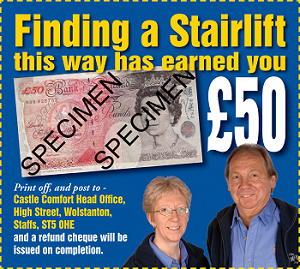 So, back to stairlifts - if you, or a loved one need some help up he stairs at home, then please give our Macclesfield office a call on 01625 886599. - you may even need a haircut too! Meanwhile we’ll take you on a short tour of Macclesfield’s delights! Hello all Maxonians! This is the affectionate term for someone from Macclesfield which has only come into existence in the last 20 years or so mainly via the media. The town name Macclesfield is thought to derive from old English for ‘Maccels’ open country’ from the Saxon Macca i.e. Macca’s fields. Presumably not ancestors of Paul McCartney! It is often referred to as Silk town as it once had a thriving silk industry though more traditionally it was known as Treacle town! Legend suggests this because a ship spilt a barrel of treacle on one of the streets and all the poor rushed out to scoop it up. It is more likely to be that the mill owners supplied unemployed weavers with barrels of treacle! Macclesfield is a happy town according to a survey carried out just three years ago. In fact it was the 5th happiest of 273 areas in Britain. The survey was carried out by the Universities of Sheffield and Manchester which asked residents to rate themselves in terms of personal well-being. Maybe it’s Macclesfield’s pleasant location that makes them happy? You can find it in east Cheshire some 41 miles east of county town Chester close to the county borders with Greater Manchester, Derbyshire and Staffordshire. It is only 20 miles north of Castle Comfort Stair Lifts ‘home town’ of Stoke on Trent and 18 miles south of Manchester and the Peak District is just a stone’s throw away in the east. In fact Macclesfield and Buxton (12 miles away in neighbouring Derbyshire) are joined by The Cat and Fiddle Road which is named after the pub which sits at the top. It has great views over the Peak District, the Cheshire Plains and the conurbation of Greater Manchester, and is regularly named the most dangerous road in Britain and which has become a popular ride for motorcyclists. Did you know that Macclesfield is the original home of Hovis bread – not the pretty southern hill (Gold Hill, Shaftesbury, Dorset) that the old advert used to show? The small village of Disley still within the Borough of Macclesfield and just 10 miles from the town is close to nearby Lyme Park, a large estate with a Tudor mansion. Disley itself was once home to at least one cotton mill, its name in Anglo-Saxon means windy settlement presumably because of its geographical location on the edge of the Peak District. It still retains its old world charm and has a few famous connections: TV presenter David Dickinson once had an antique shop here – his first; it’s the birthplace of author Christopher Isherwood; British historian AJP Taylor lived here. Do you still have old world charm? Do you typify Maxonians in being happy? Let Castle Comfort Stair Lifts make you even happier with their offering of a wide range of stairlifts. As the national agent for all stairlift manufacturers we can be sure to find the right one for you either brand new, reconditioned or even in part-exchange for your old one. Why not watch our video when our founder Keith explains how and why the company came about and then give us a call on 01625 886599 to discuss how we can help? In the meantime take a look at the price comparisons on our website. The 17th Century Macclesfield Town Hall at the heart of this market town is still very much in use for council business but also as an event venue and for private hire. Armoury Towers was once the home of the Militia in Macclesfield during the 19th Century but this beautiful Grade II listed building is now private apartments. The Grade I listed building at Lyme Park was built in the 16th century by the LeighsPemberton, Darcy’s home in the BBC’s Pride and Prejudice and in complete contrast was a location used in an episode of Red Dwarf. Macclesfield is the home town of blues singer John Mayall; Ian Curtis of Joy division grew up here as did his band-mate Stephen Morris; Gillian Gilbert also hails from here and she later joined Stephen Morris to form New Order and is married to him too. Stoke City player Peter Crouch was born in Macclesfield; he has become famous for his robotic celebratory dance. The dance was apparently inspired by the Arctic Monkeys’ song, ‘I bet you look good on the dance floor’. Jonathan Agnew, cricketer turned commentator was born here too; as was Olympic yachtsman Ben Ainslie. Former Radio 4 Presenter on the Today programme, Brian Redhead was born and died here; author Vera Brittain who wrote Testament of Youth about her experiences in WWI spent part of her childhood in Macclesfield. Can you recall some memories from times gone by when you were more sprightly? We bet you can. Let Castle Comfort Stair Lifts help lift your spirits with some assistance to get up those stairs. We can supply straight and curved stairlifts which ever suits you best. If the outlay is too much there are grants available or if you can’t wait for the process of applying then you could consider a 0% finance deal. Why not give us a call to find out more on 01625 886599 and don’t forget you can use our £50 voucher towards your purchase. I first met Castle Comfort Stairlifts when they contact me to give me some money. Keith and Ann have always support charities and decided to give me a few thousand pounds towards my Cancer Research UK fundraising. All they asked from me in return was to run the 'Potter Arf' marathon in Stoke on Trent with a Stirlift on my back !! Over the years Ive seen an honest and altruistic charm in Castle Comfort which starts with Keith the MD and goes all the way down to the office girl. It has been our pleasure to write this unsolicited testimonal for them, and I know you will do the same once you have dealt with them. Sadly you couldn't get Macclesfield born, radio 4 presenter, Brian Redhead to do your stairlift presentation- but where did the American accent come from ? Love the presentation! Delighted to hear that Macclesfield now has a Castle Comfort Centre - it's a superb shopping centre anyway and this is a great addition to its facilities. I also go to Macclesfield in preference to Hanley! Having many friends in the area, I shall certainly pass the word around! Keith and Ann are very good people, I have the pleasure of knowing them personally. They never hesitate to participate in charitable things and I am sure that their stairlifts are very good and serve well that the people of Macclesfield in Cheshire. Great for the area!